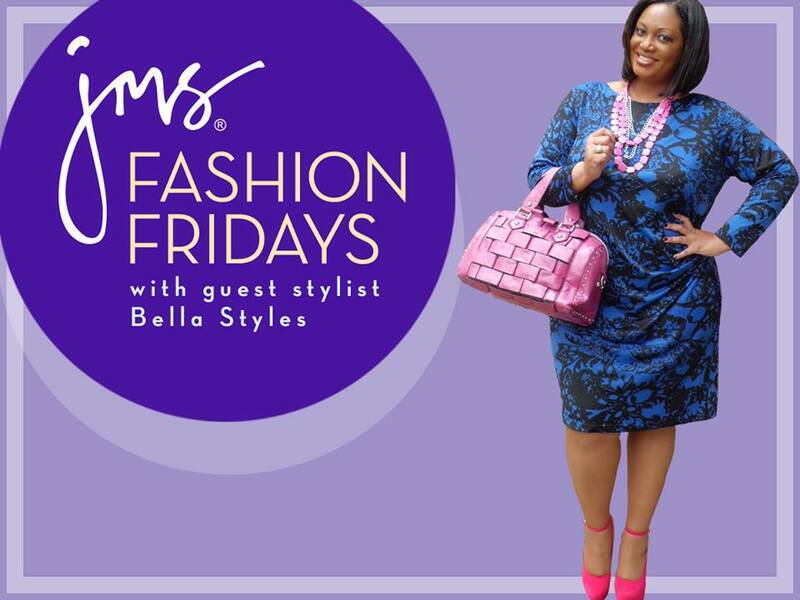 Wow, this Just My Size Fashion Fridays has been a wonderful project to work on for the last few months and I can’t believe how fast time has flown past. I have thoroughly enjoyed sharing my looks with you all each week and I hope that you were able to get a few style tips and update your wardrobe along the way also. 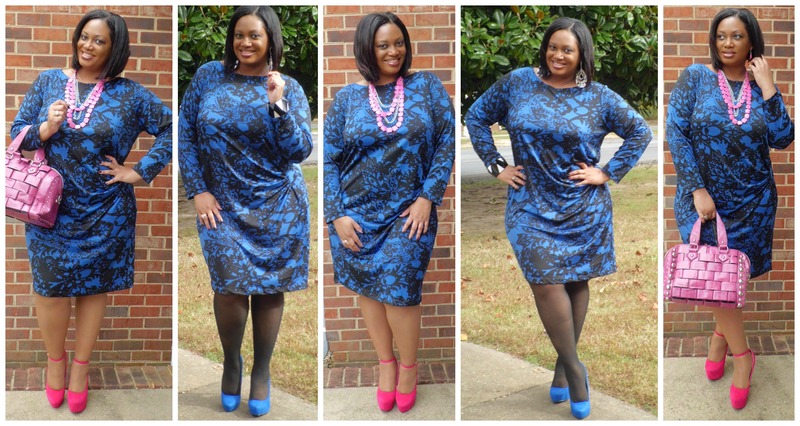 For my final Fashion Fridays look for the season, I chose to don the Long-Sleeve Blue/Black Printed Dress with Flattering Side Shirring (Style #24974, $39.99, Sizes 2X-4X). I fell in love with this dress upon first sight while reviewing the Just My Size website. 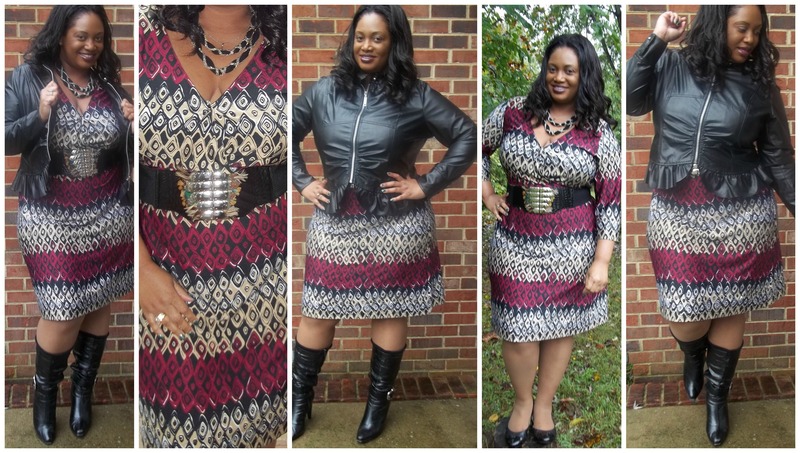 Anything that has shirring on the sides is very figure-flattering for any size woman. I first wore it as a trendy look by adding fuchsia accessories and Hanes Silk Reflections Plus Control Top, Enhanced Toe Pantyhose in Barely There (Style #883, $21.99 3-pk, Sizes 1-5). This would be a look for Christmas dinner perhaps. Then I wore the dress for more of an office setting with black and white jewelry, blue pumps and the Black Just My Size Seasonless Women’s Tights (Style #25376, $4.49, Sizes 2X-4X). Even though the tights keep your legs warm and I’m sure that you’re going to be wearing a long coat as well, I would suggest wearing a Snip-it Full Slip in Black (Style #18673, $17.99, Sizes 1X-4X) underneath the dress. My Grandmother always taught me that a lady wears a slip year-round under her dresses. As a bonus, I wore another JMS dress too this week as a backup option. It is the 3/4-Sleeve Faux-Wrap Dress ( Style #24969, $39.99, Sizes 1X-4X). I wore it with boots and a faux-leather coat for a dressy look and then with flats for a work look. 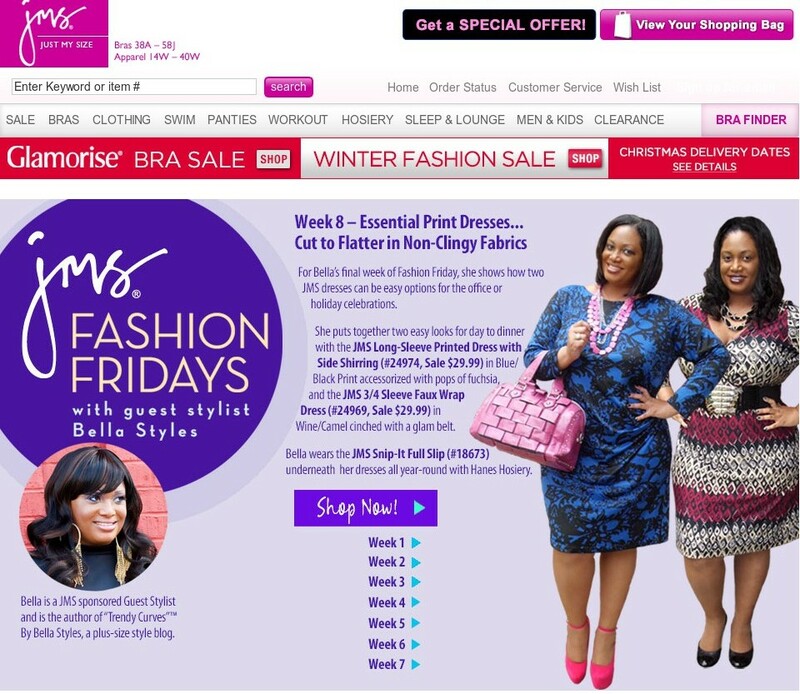 Also enjoy the 12 cent shipping offer TODAY only…..
Shop the looks here at the Just My Size Fashion Friday’s page!